Apple has announced that iOS 8 will be released on Wednesday, September 17, two days prior to the release of iPhone 6. As usual with iOS, the major software update will arrive as a free download from the Over-the-Air update mechanism, or through iTunes. 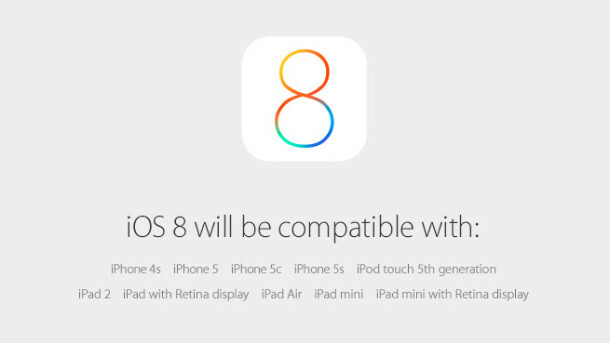 iOS 8 is compatible with iPhone 4S, iPhone 5, iPhone 5C, iPhone 5S, iPad 2, iPad 3, iPad 4, iPad Air, iPad Mini, iPod touch 5th gen, and iPad Mini with Retina display. The new iPhone 6 and iPhone 6 Plus will ship with iOS 8 pre-installed. iOS 8 includes many new features and enhancements to the mobile operating system, making it a must-have update for all iPhone and iPad users. With the update appearing next week, now is a great time to prepare for the iOS 8 update by doing some house cleaning and backing up your devices. Mac users also have extra incentive to install iOS 8 on their devices thanks to the Handoff feature of OS X Yosemite, which allows users to pass sessions from their iOS devices to their Macs, and vice versa. Presumably, iOS 8 will be required for compatibility with the Apple Watch and it’s slew of new features as well. Developers can get access to iOS 8 today with the freshly released GM build.